Scrap, or sell off the old system, and get all new lenses, and bodies. Stick with the old system, and seek out older used lenses and bodies to expand capabilities. Find a way to use your old lenses with a new system based on the current bodies. Each of these approaches has it's own advantages and disadvantages. Adapting the older FD series lenses to work on the newer EF series cameras is not as simple as just changing the mount. As was mentioned in my lens sections, the FD series uses a mount and linkage which is purely mechanical, while the EF series uses a linkage which is purely electronic. Even so, lenses are lenses, and it would seem that there should be a way to mount one style of lens on a different style of camera. To a certain extent, you can, but there are some trade offs. I should first mention that, though FD lenses can be made to function on EF cameras, there is no way to get EF lenses to work on FD cameras. There was never even an attempt made to produce a converter for this purpose. One main reason for this is market demand. There were a number of photographers who were unwilling to abandon their extensive lens systems, when Canon introduced it's new series of cameras. They wished to avail themselves of some of the new offerings, but not at the expense of an entire new system of cameras and lenses. A converter would be just the thing, and was even considered to be a necessary offering in order to prevent lagging sales of the newly introduced cameras. On the other side of the coin, there is really little need for the old FD user to wish to use the EF series of lenses. FD lenses are plentiful, and less expensive, while being the equal, optically, of the newer models. In addition, the new features, autofocus, and electronic integration, would be unusable on the older style cameras. Even standard full aperture metering, and use of the full range of F-stops would not be possible. A close look at the lens, and the mount makes the reason plain. The EF lens has no aperture control; there is no way to stop the lens down. These functions are done electronically, via signals from a compatible body. Even if properly mounted to an FD style body, the lens would only be capable of shooting at it's widest aperture. Canon introduced an adapter unit for the EF lenses, at about the same time the lenses themselves were introduced. the unit was to be sold to working pros only, and was offered in limited quantities, for a short period of time. The Canon adapters are now very expensive, on those rare occasions when they might be found. Some after market companies also offered converters (some still do), but all have limitations. The Canon unit is the best, not surprisingly, and permits the use of the lens, in manual focus mode, requiring stopped down metering. Neither of these are serious limitations, particularly for the experienced photographer. The adapter itself was simple in concept. One end had an EF mount, while the other used an FD mount. There were no linkages, since the mechanical FD system, and the electronic EF systems can not really be linked. One thing which did need to be added to the basic metal mount, was a small single element lens. 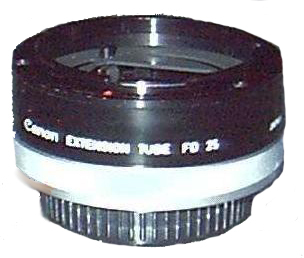 This lens is used to make up for the fact that the converter changes the distance between the film plane, and the FD lens. Most of the units offered by other manufacturers come with the warning that the adapters will impair the ability of the lens to focus at infinity. They are generally offered as macro adapters. Having purchased, and used one, I found myself pleasantly surprised. The model I tried, retains the infinity focus of the lens, though the focus scale is no longer accurate. It is quite possible, with this unit, to focus "past" infinity. Other than this minor, but irritating quirk, the converter is perfectly satisfactory. Other than the focus issue, the adapter requires all metering to be done in stopped down mode. Since there are no mechanical linkages with the camera, the lens must be set to stop down, before it is installed into the adapter. Using the adapter Before using the adapter to mount an FD lens onto an EF body, the FD lens must be set to manually stop down. On an FD or FL lens, this is done by pushing the stop down pin, counter clockwise until it locks. The two photographs show an FD lens with the pin in it's normal position, for full aperture metering, and in position for manual stop down metering. In the case of certain older lenses which do not have a lockable pin, the converter itself has a stop, which can be seen in the photograph of the unit mounted on a camera. This pin is at the six o'clock position, on the bottom of the converter, and will prevent the travel of a non locking aperture pin. The Photo to the left shows a Canon FD lens with it's stop down lever in the normal position, for full aperture metering. The photo to the right shows the same lens with the lever pushed to it's locking position for manual aperture metering. Obvious, in the photos below, is the slight increase in length, added by the conversion unit, once the lens is mounted. This is compensated for, by the element in the converter itself, but there are some issues with which the photographer should be aware. The EOS series of cameras were designed, from the outset, as auto focus units. This being the case, there are no focusing aids in the finder. This is complicated by the fact that the lens in the converter can't help but degrade image quallity, to a certain extent. Added to this, is the fact that the viewfinder image dims, as smaller apertures are selected. The old photographers technique of metering, and focusing in separate steps will have to be used. In order to make up for any possible image degradation, it is probably best to go a couple of steps below maximum aperture, to insure sharp images. Over all, I can find little fault with using the adapter, as a temporary measure. While you certainly do give up a few things, you get the use of your entire old lens system in return. In my own case, I bit the bullet, and purchased a Canon D30 digital camera. I then found myself facing the prospect of assembling an entire new set of lenses, to replace my old FD glass. I will eventually end up with an EF system, but for now, this gives me a bit of breathing room, so that I do not need to go out and replace everything at once. Used in this manner, the purchase of an adapter is a logical choice. As a long term replacement for a system of lenses to mate with a new system of EOS cameras, an adapter make a bit less sense. Eventually, I will tire of stop down metering, degraded image quality, and fussy focusing. My pictures will be a bit less sharp than I like, and will take just an instant longer to compose and shoot.